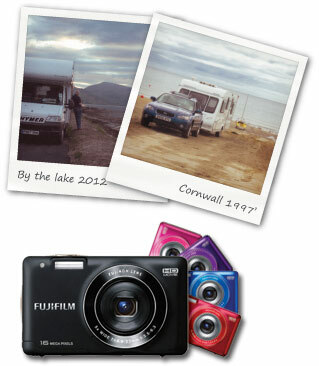 There’s nothing we like more than sharing interesting caravan and motorhome photos with our readers, and as such we have just launched a brand new photo vote competition via our facebook page which not only allows you to upload your favourite holiday snaps, but also gives you the chance to win a brand new FujiFilm FinePix Digital camera in your choice of five colours! We want as many people to upload photos as possible, but even if you just visit the competition page and vote for one thats already there you’ll be entered into the prize pot and have your chance to win the camera. Plus as an extra incentive we’re going to feature the photo with the most votes in our fancy new facebook header image and give it pride of place on our blog here too. To be in with your chance of winning the digital camera simply visit the competition page and upload a photo or vote for your favourite out of the ones that are already there – it’s that easy!